Aveeno Coupons | SAVE up to $15.00 off Aveeno Products PRINT NOW! New Aveeno Coupons! SAVE up to $15.00 off Select Aveeno Products. 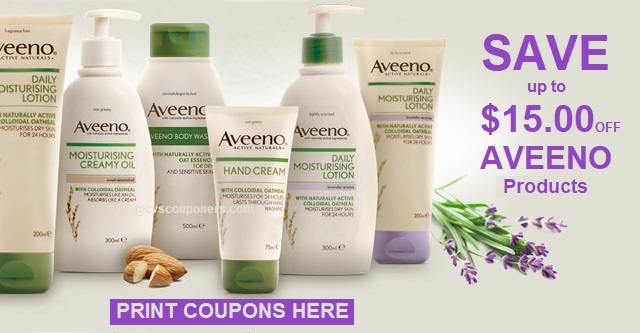 Print All 5 Aveeno Coupons Here. We got new high value Aveeno Suncare, Suncare, Haircare, Body Wash, Body Lotion and Facial Cleanser Coupons. Hurry and print before they are gone. New Coupons! SAVE up to $15.00 off Select Aveeno Products PRINT NOW!